In normal fetal development, the paired anterior cardinal veins drain the upper body and extremities of the fetus and become connected by an oblique vessel. During the 8th week of embryological development, a communication forms between the veins (future innominate [brachiocephalic] vein). The distal end of the left anterior cardinal vein degenerates (forms the ligament of Marshall), and the remaining right anterior cardinal vein ultimately becomes the right superior vena cava (RSVC). The distal end of the left anterior cardinal vein drains into the left horn of the sinus venosus (future coronary sinus) before it degenerates; this explains the drainage pattern of a PLSVC into the coronary sinus (see the image below). When a PLSVC drains into an UCS, obligate drainage to the left atrium results in the right-to-left shunt and cyanosis. Failure of the distal left anterior cardinal vein to degenerate is possible with or without degeneration of the right cardinal veins. A PLSVC can be the sole drainage of systemic venous blood in the upper extremities and the head or may occur in conjunction with a RSVC. With dual superior vena cavae (SVCs), a bridging innominate (brachiocephalic) vein is often not present. Embryologic remnant resulting in persistent left superior vena cava (PLSVC). The dotted line illustrates the degenerated left anterior cardinal vein. 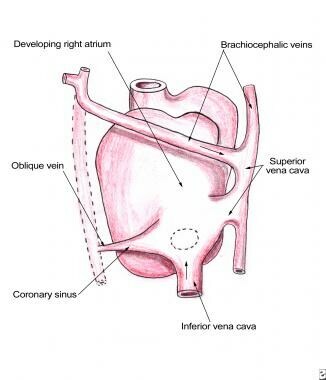 This posterior view illustrates how the left superior vena cava drains into the coronary sinus. As in other ASDs, indications for surgical repair include complications from right-to-left shunting, right heart volume overload, paradoxical emboli, and brain abscesses. UCS may be repaired when presenting with other cardiac lesions. The PLSVC enters the pericardium anterior to the left pulmonary artery. It then runs posterior to enter the left atrium and drain through the coronary sinus to the right atrium. When the wall between the coronary sinus tube and left atrium fails to form, which is thought to be caused by the maldevelopment of the atriovenous fold, the systemic venous blood drains directly into the left atrium. This fenestration into the left atrium usually occurs between the left atrial appendage and the left upper pulmonary vein, as shown in the image below. When this fold is missing, the defect is called a UCS or UCS-ASD. The fenestration is seen draining between the left atrial appendage and the pulmonary veins. Surgery is contraindicated in the presence of major genetic abnormalities. Ramos N, Fernandez-Pineda L, Tamariz-Martel A, et al. [Absent right superior vena cava with left superior vena cava draining to an unroofed coronary sinus]. Rev Esp Cardiol. 2005 Aug. 58(8):984-7. [Medline]. El-Eshmawi A, Tang GH, Pawale A, Anyanwu AC, Adams DH. Unroofed coronary sinus in an adult. J Card Surg. 2013 Jan. 28(1):19-22. [Medline]. Kelpis TG, Ninios VN, Giannakoulas G, Spanos GP, Nikoloudakis NE, Pitsis AA. Unroofed coronary sinus as a cause of right heart dilatation in an elderly patient. Hellenic J Cardiol. 2012 Sep-Oct. 53(5):390-1. [Medline]. Sanchez Mejia A, Singh H, Bhalla S, Singh GK. Chronic cyanosis due to persistent left superior vena cava draining into the left atrium in the absence of a coronary sinus. Pediatr Cardiol. 2013 Aug. 34(6):1514-6. [Medline]. Attenhofer Jost CH, Connolly HM, Danielson GK, et al. Clinical features and surgical outcome in 25 patients with fenestrations of the coronary sinus. Cardiol Young. 2007 Dec. 17(6):592-600. [Medline]. Troost E, Gewillig M, Budts W. Percutaneous closure of a persistent left superior vena cava connected to the left atrium. Int J Cardiol. 2006 Jan 26. 106(3):365-6. [Medline]. Kong PK, Ahmad F. Unroofed coronary sinus and persistent left superior vena cava. Eur J Echocardiogr. 2007 Oct. 8(5):398-401. [Medline]. Chauvin M, Shah DC, Haissaguerre M, et al. The anatomic basis of connections between the coronary sinus musculature and the left atrium in humans. Circulation. 2000 Feb 15. 101(6):647-52. [Medline]. Watanabe M, Ono S, Okada Y, et al. Spontaneous closure of an unroofed coronary sinus. Pediatr Int. 2004 Dec. 46(6):722-5. [Medline]. Joffe DC, Rivo J, Oxorn DC. Coronary sinus atrial septal defect. Anesth Analg. 2008 Oct. 107(4):1163-5. [Medline]. Shah SS, Teague SD, Lu JC, Dorfman AL, Kazerooni EA, Agarwal PP. Imaging of the coronary sinus: normal anatomy and congenital abnormalities. Radiographics. 2012 Jul-Aug. 32(4):991-1008. [Medline]. Payne DM, Hamilton A, Milne B, Tanzola R, O'Reilly M. Intraoperative diagnosis of unroofed coronary sinus after aortic valve replacement. Ann Thorac Surg. 2012 Jan. 93(1):296-7. [Medline]. Kwon SH, Oh JH, Kim SJ. Partially unroofed coronary sinus found incidentally in adult patient. Arch Cardiovasc Dis. 2011 Mar. 104(3):202-3. [Medline]. Alexi-Meskishvili V, Dahnert I, Beyer E, et al. Successful total correction of complete atrioventricular canal, total anomalous pulmonary venous drainage and unroofed coronary sinus in an infant. Eur J Cardiothorac Surg. 1999 Jan. 15(1):95-6. [Medline]. Ueno T, Sakata R, Iguro Y, et al. Radical repair of cor triatriatum with partially unroofed coronary sinus and persistent left superior vena cava 35 years after operation for tetralogy of fallot. J Card Surg. 2008 Nov-Dec. 23(6):747-9. [Medline]. Yoshihara K, Ozawa T, Sakuragawa H, et al. [Noonan syndrome associated with atrial septal defect, pulmonary stenosis, and completely unroofed coronary sinus without LSVC: a case report]. Kyobu Geka. 1999 Feb. 52(2):134-7. [Medline]. Drinkwater DC, D’Agostino HJ. Anomalous pulmonary and systemic venous connections. Baue AE, Geha AS, et al, eds. Glenn’s Thoracic and Cardiovascualr Surgery. 6th ed. Appleton & Lange: Conn; 1996. 1113-1114. Kouchoukos NT, Blackstone EH, Doty DB, Hanley FL, Karp RB. Unroofed Coronary Sinus Syndrome. Kirklin/Barratt-Boyes Cardiac Surgery. 3rd ed. Philadelphia, Pa: Churchill Livingstone; 2003. 790-91. Xie MX, Yang YL, Cheng TO, et al. Coronary sinus septal defect (unroofed coronary sinus): Echocardiographic diagnosis and surgical treatment. Int J Cardiol. 2013 Sep 30. 168(2):1258-1263. [Medline]. Brancaccio G, Miraldi F, Ventriglia F, et al. Multidetector-row helical computed tomography imaging of unroofed coronary sinus. Int J Cardiol. 2003 Oct. 91(2-3):251-3. [Medline]. Ngee T, Lim MC, De Larrazabal C, Sundaram RD. Unroofed coronary sinus defect. J Comput Assist Tomogr. 2011 Mar-Apr. 35(2):246-7. [Medline]. Huang XS. Images in cardiovascular medicine. Partially unroofed coronary sinus. Circulation. 2007 Oct 9. 116(15):e373. [Medline]. Di Bernardo S, Fasnacht M, Berger F. Transcatheter closure of a coronary sinus defect with an Amplatzer septal occluder. Catheter Cardiovasc Interv. 2003 Oct. 60(2):287-90. [Medline]. Torres A, Gersony WM, Hellenbrand W. Closure of unroofed coronary sinus with a covered stent in a symptomatic infant. Catheter Cardiovasc Interv. 2007 Nov 1. 70(5):745-8. [Medline]. Santoro G, Gaio G, Russo MG. Transcatheter treatment of unroofed coronary sinus. Catheter Cardiovasc Interv. 2013 Apr. 81(5):849-52. [Medline]. Myers JL. Management of infants and children. Lemmer JH, Vlahakes GJ, eds. Handbook of Patient Care in Cardiac Surgery. 7th ed. Philadelphia, Pa: Lippincott Williams & Wilkins; 2010. 271-306. Takahashi H, Kaminishi Y, Saito T, et al. Anatomical repair of partially unroofed coronary sinus syndrome through the coronary sinus orifice. Ann Thorac Cardiovasc Surg. 2005 Jun. 11(3):208-10. [Medline]. Ootaki Y, Yamaguchi M, Yoshimura N, et al. Unroofed coronary sinus syndrome: diagnosis, classification, and surgical treatment. J Thorac Cardiovasc Surg. 2003 Nov. 126(5):1655-6. [Medline]. De Leval M. Anomalies of the systemic venous return. Stark J, De Leval M, eds. Surgery for Congenital Heart Defects. 2nd ed. Philadelphia, PA: WB Saunders Co; 1994. 322-326. Reddy VM, McElhinney DB, Hanley FL. Correction of left superior vena cava draining to the left atrium using extracardiac techniques. Ann Thorac Surg. 1997 Jun. 63(6):1800-2. [Medline]. van Son JA, Black MD, Haas GS, et al. Extracardiac repair versus intracardiac baffle repair of complex unroofed coronary sinus. Thorac Cardiovasc Surg. 1998 Dec. 46(6):371-4. [Medline]. Chihara S, Yasunaga H, Todo K. Anastomosis of left to right superior vena cava for repair of unroofed coronary sinus. Gen Thorac Cardiovasc Surg. 2012 Apr. 60(4):244-6. [Medline]. Mainwairing RD, Lamberti JL. Atrial septal defects. Kaiser LR, Kron IL, Spray TL, eds. Mastery of Cardiothoracic Surgery. Philadelphia: Lippincott-Raven; 1998. 683-686. Moore KL. 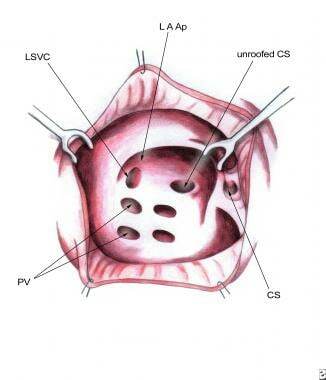 The Developing Human: Clinically Oriented Embryology. Philadelphia: WB Saunders Co; 1982. 299-302. Tadokoro N, Hoashi T, Kagisaki K, et al. Clinical features and surgical outcomes of coronary sinus orifice atresia. Pediatr Cardiol. 2015 Oct 26. [Epub ahead of print]. [Medline]. Nakano Y, Iwamoto M, Masuda M. Usefulness of real-time three-dimensional trans-oesophageal echocardiography for detection of isolated unroofed coronary sinus. Cardiol Young. 2015 Jan. 25(1):181-3. [Medline]. A venous cannula stent opens the coronary sinus while sutures are placed. A pericardial patch is used to baffle the pulmonary veins directly toward the mitral valve. This approach allows unobstructed flow from the orifice of the left superior vena cava (LSVC) to drain to the right-sided atrium.